Regardless of whether you grew up in the 1950’s or 1990’s, surely, you’ve heard your share of warnings and or lectures on how sugar is bad for your teeth and how excess sweets can cause cavities and lead to tooth decay. Although this concept has been drilled into the minds of kids for countless years, once grown into adults, many of these same kids still find themselves developing tooth decay and other related issues! With recent advancements made in dental technology, (as mentioned in previous blog posts) you’re probably wondering how this could happen? The answer is actually quite simple. While the first issue is self-explanatory, the second reason may have you pointing out the seemingly contradictory fact that young children have been taught that sugar hurts your teeth for many years, as mentioned earlier. Indeed, children are taught such a rudimentary concept from a young age. However, the education usually goes no further than this; therefore, a full understanding as to what tooth decay truly is, eludes them as children and continues when they become adults. As one of the most commonly encountered issues within the realm of professional dentistry, tooth decay is the progressive destruction of a tooth’s enamel, in which the outer lining of the tooth is slowly broken down. As the hardest substance to be found within the human body, tooth enamel is the strong outer tissue of the tooth, that acts as a safeguard for the intricate inner layers and chambers within the tooth. Despite the apparent toughness of the outer enamel, if subjected to years of abuse or neglect, the enamel will eventually demineralize and break down, thereby leaving the tooth vulnerable to the outside elements. In this state, your tooth is essentially at the mercy of whatever substances it may encounter. If foods or beverages with high levels of acidity, those that contain excessive amounts of sugar continue to be regularly consumed, it’s inevitable that your teeth begin to deteriorate, resulting in cavities, significant damage, or other related complications. The effects of tooth decay can have a significant impact on your overall health by interacting with pre-existing conditions and causing irreversible damage. However, if detected early the condition can be treated and any serious damage that the disease can cause can be minimized. As mentioned earlier, knowledge is a key element when dealing with tooth decay; therefore, knowing what to look for is crucial in preventing tooth decay from progressing. Teeth that are overly sensitive can be indicative of tooth decay, as well as several other inner oral conditions and certainly should not be taken lightly! This tingling and slightly painful sensation is most often triggered by extreme hot or cold temperatures and may likely worsen overtime. Related Article: Is tooth sensitivity making it difficult to enjoy the holidays? Much like the previous symptom, an occasional sharp pain may become an occasional occurrence; however, these pains may seem to occur without an apparent cause. Such toothaches are undoubtedly a strong indication of decay or damage and should be examined by a professional dentist as soon as possible. Related Article: Do You Need Emergency Dental Care? While having stained and discolored teeth might seem to be more of a cosmetic problem, it may also be a health issue! By showing visible signs of wear and tear, the enamel of your teeth has likely broken down, thus leaving your teeth vulnerable and ripe for decay. If you have begun to notice the appearance of sunken, pit-like areas on the surface of your teeth or even small cracks and holes, you are indeed suffering from tooth decay and should see your dentist right away! Although these pits, cracks, and holes might appear small at first, rest assured they WILL eventually get worse and if left untreated, will ultimately destroy your tooth. 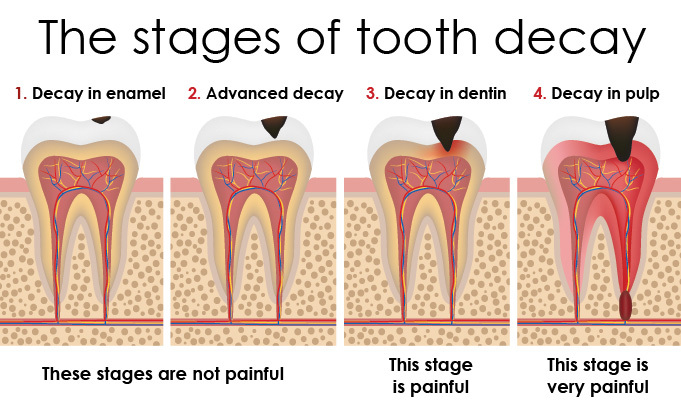 Tooth decay is a disease and like any disease, it needs to be treated. However, unlike other diseases, you yourself can take an active role in fighting this disease. Listed below are some helpful tips that prevent and reduce the effects of tooth decay. Remember, although these tips can certainly help, it is STILL imperative that you make an appointment to see your dentist! Daily oral hygiene is something that’s very easy to overlook. However, as mundane as it may seem, the importance of practicing proper oral hygiene on a routine basis cannot be stressed enough. As it is often the difference between those who have tooth decay and those who don’t. For best results, a thorough brushing twice daily and sometimes between meals is your best bet, and of course don’t forget to floss! If you have a sweet tooth, or regularly indulge in acidic sodas or sugary treats, you might want to consider cutting back or finding new alternatives as these products put your teeth under constant attack. Additionally, foods that are particularly sticky or chewy can also present an issue as they tend to get stuck between teeth and are often difficult for a tooth brush to reach. Related Article: Sugar Hurts Teeth: Do You Sip and Snack All Day? If you suffer from frequent bouts of dry mouth, your risk of building up an excess amount of plaque is considerably heightened. Therefore, rinsing and keeping your mouth properly hydrated should always be a main priority. The six-month rule is the standard allotted time between dental checkups and should certainly be adhered to, especially if you are concerned about tooth decay. While this may seem obvious, it would behoove us not to mention the risk smoking presents in developing tooth decay, as well as a litany of other illnesses. If you smoke, please … please … please consider quitting! Related Article: New Year’s Resolution: Stop Smoking! are you willing to fight it too? If you believe you might be at risk of developing tooth decay, don’t be another statistic! At Overland Park Dentistry we have the tools, knowledge, and resources necessary to aid you in this battle for your smile! Don’t be another statistic, schedule your appointment today!